Pelleting and commercialising fodder trees has never been done before on a meaningful scale in Africa. 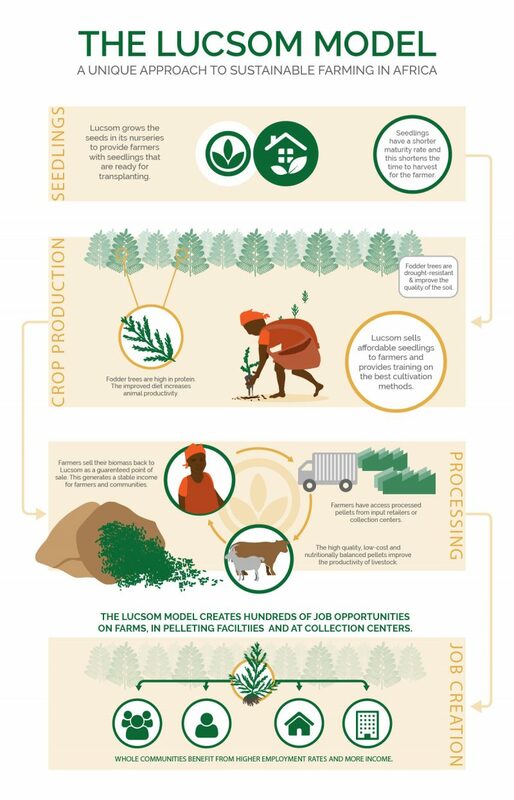 Lucsom’s model is carried out in partnership with commercial and smallholder farmers to grow and distribute seedlings, and sustainably grow and harvest biomass from fodder trees. This biomass gets pelleted along with macro and micro nutrients to produce a balanced feed for the dairy, meat and poultry market. The benefits of the Lucom model are far reaching as the end product offers an affordable source of feed for livestock that can be stored in times of need or sold for profit, improves milk and meat production, is a sustainable model for job creation and has a positive impact on the natural environment. Lucsom’s mission is to revolutionise the animal feeds market in Africa by producing nutritious, affordable feed pellets made from drought-resistant fodder trees. The small-scale subsistence farmer is at the heart of our mission and we partner with them to provide seedlings for fodder trees. Together with ongoing education and training to sustain the fodder trees on their own land, we offer favourable, long-term contracts to sell the harvested crop back to Lucsom as a cash crop. They adapt well to poor soil and improve the soil through nitrogen fixing capabilities. They are relatively fast growing. Can be used as wind breaks. Source of firewood when old tree plantations need replacing. Relatively low input costs compared with annual or biannual crops. The Flowers can provide valuable fodder for bee keeping. Tests have shown that most animals, if given the choice between the same feed in pellet or mash form, prefer pellets. Fodder tree pellets have the same performance-enhancing benefits as higher-priced products such as concentrates. Farming in Africa is a complex task and Lucsom sees a multi-layered and innovative solution. The commercialisation of fodder trees for pellet production presents a lucrative market opportunity for investors and is a powerful way to break the cycle of poverty and famine in Africa. But we need your help. Government and non-government organisations, aid funders, donors and investors are invited to get in touch to find out more about our work and how we can make a difference together. Join our mailing list to stay up-to-date with our latest news. Contact Lucsom’s CEO Devan Khagram for ways to partner with us.